When the . . . thing first insinuated itself into the Lund family household, they were bemused. Vaguely human-shaped, its constantly-changing cravings seemed disturbing, at first, but time and pressure have a way of normalizing the extreme. Wasn’t it always part of their lives? As the family make more and greater sacrifices in service to the beast, the thrall that binds them begins to break down. Choices must be made. Prices must be paid. And the Lunds must pit their wits against a creature determined to never let them go. It’s psychological warfare. Sanity is optional. Given how much I loved Jeremy Shipp’s last gothic novella, The Atrocities, I was more than a little eager to pick up Bedfellow. An unsettling tale of a family home being invaded by a bizarre intruder who begins to wage psychological warfare on them by changing their memories? Talk about disturbing! Hendrick prides himself on always responding well to an emergency, but he freezes in place when a man in a Space Jam nightshirt crawls through their living room window. 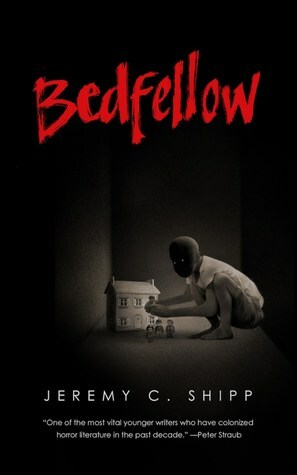 Let me say this: if I thought The Atrocities was strange, it had nothing on Bedfellow. This story is so convoluted and bizarre that it’s actually a little difficult to follow at times, but I think that’s part of the appeal—it takes you on such a ride that I couldn’t have stopped myself from being immersed if I wanted to, and that only adds to the eerie vibe the entire situation gives off. She’s afraid of the man in her imagination who still might be out there, squatting in the dark, waiting to push open the living room window so that he can crawl inside. Despite how unusual and fantastical the entire ordeal is, there’s something very “real world” unsettling about it. When I read a book about zombies or demonic possession, I’m not going, “What if this happened to me?” but I can’t deny that I thought, more than once, how terrifying it would be to have my very own ‘Uncle Marvin’ in my life—particularly because I wouldn’t even know anything was wrong, and that’s the scariest part of all to me. He probably shouldn’t open himself up to a monster like this. When all’s said and done, though, Hendrick doesn’t mind being a fool if it means he can finally live the life he’s always deserved. As for the characters, the narrative switches between the father Hendrick, the mother Imani, and the kids, Kennedy and Tomas. Imani’s perspectives were my favorite because I related so much to her, between her fierce protective nature, her obsession with morbid podcasts, and her nonstop pun usage that had me quick to grin or groan alike. On the other hand, the father, Hendrick, is a monster in his own right: he’s a disgusting and unkind man whom I hated more as time progressed, but he offers an interesting parallel where we can see that even though Uncle Marvin is the terror of the story, sometimes humans are even worse. My only complaint about Bedfellow, and the reason this is a 4.5 instead of a solid 5, is that I think it’s a little longer than it needs to be. The first 50 pages or so were a little tough to get into, and I can’t help but think that I wish they’d been trimmed down so we would have gotten into the action a little sooner. That said, it’s a minor complaint, and all in all, I genuinely enjoyed Bedfellow and can’t wait to see what Jeremy cooks up next. If you enjoy surreal, quiet horror, I absolutely recommend picking up a copy. All quotes come from an advance copy and may not match the final release. Thank you so much to TorDotCom for providing me with this ARC in exchange for an honest review! Super excited to see your rating, but then I’m a little worried because you described it as strange, and oof, I don’t do well with weird books. If I have time, I really should give it a shot though, it sounds crazy interesting!